In the life of a vehicle, 15 years is a long time especially if it is an ambulance used for taking close to a 1,000 calls a year. That ambulance has been out of service for quite a while. 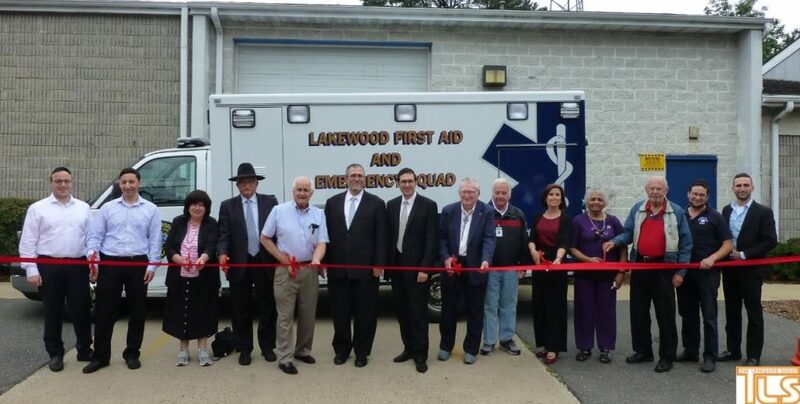 Recently the Lakewood First Aid Volunteer Squad showcased its brand new ambulance and cut the ribbon to make it official. Jake Sussman, president of the Volunteer EMS, said, “The fact that we now have a new ambulance that will be in service is very exciting. Getting this ambulance has been a long process, and people have put in countless hours since 2014 to make getting this ambulance a reality. We have our friends from the Township Committee, the UEZ, and people throughout the township who have helped us get here. I want to give a personal thank you to Moe Heinemann, the captain of Lakewood First Aid in 2014, who put in countless hours working on this project. About 40 volunteers, all from Lakewood, dedicate at least 12 hours a week, handling about 80 calls a month. Many volunteers help out more than 12 hours a week, responding to calls even when they are at work. Meir Lichtenstein, the Township Liaison to emergency services, said, “First of all, we have to thank the volunteers who are here. The reason we wanted the active adult communities to attend this ribbon-cutting is because our volunteers are on track for taking 1,000 calls this year in Lakewood Township, and most of those calls are going to be in the senior communities close by to this building. Several groups contributed to the cost to the new ambulance which costs more than $100,000. Patricia Komsa, the executive director of the Lakewood UEZ, said that the $20,000 deposit for the purchase of the ambulance came from UEZ general project funds. Other contributors were the township and a number of groups that donated funds.